The Sidmouth hotels listed below are either in the town or we have given a rough guide as to how far they are from Sidmouth. We hope you enjoy your stay and find your ideal accommodation. Station: HONITON. 8miles. Manor road, EX10 8RU. From M3: Exit at junction 8 onto A303 sign posted the South West. The A303 becomes the A30. At Turks Head junction turn left onto the A375 sing posted Sidmouth. Follow the signs for Sidmouth Town Centre. At the sea front turn right onto the Espanade. Continue up the hill following signs for the public car park. Turn right onto Manor road, the entrance to The Westcliff is on your right. Station: EXETER ST DAVIDS. 15miles. Travelling by car: from M5 Junction 30. Follow A3052 to Sidmouth. Hotel is located on the Esplanade. Station: EXETER ST DAVIDS. 15miles. Travelling by car: from the M5, take Junction 30. Then follow the A3052 to Sidmouth. The hotel is located on the Esplanade. Set on Devon's Jurassic Coast, The Bedford Hotel is located on Sidmouth's seafront. It has individually designed rooms with flat-screen TVs, limited free parking and a restaurant overlooking Lyme Bay. Blue Ball Inn offers 3 traditional bars, and rooms with free Wi-Fi and Freeview TV. Sidmouth is just 1 mile away. The Blue Ball Inn's gardens have a seating area, and a full English breakfast is provided to guests. Set in 7 acres of outstanding natural beauty, this country house hotel with cottages and a heated outdoor pool offers a relaxed atmosphere, professional service and luxurious surroundings. 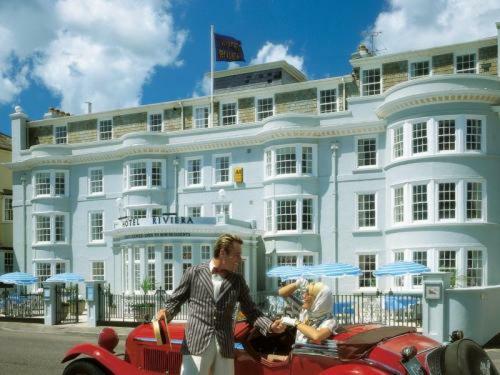 Few hotels in Devon can offer the charm and character that you will find at The Westcliff. Whatever your requirements, you can be sure that the Westcliff will provide a room to suit your needs. Superbly positioned on the seafront, 4-star Hotel Riviera in Sidmouth has an elegant regency facade, providing the perfect base from which to explore the beautiful surrounding area. Sitting on the Regency seafront with wonderful sea views, The Belmont Hotel is one of Sidmouth's popular 4-star hotels. It is a short level walk from the town centre. This elegant hotel is often referred to as one of England's finest. 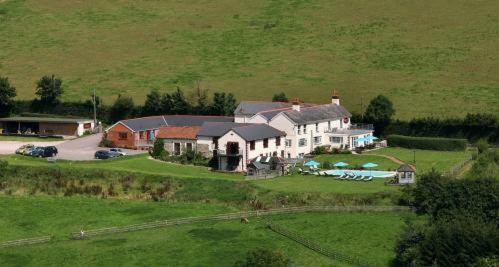 Standing in 5 acres of landscaped gardens, it has magnificent views over Sidmouth and its ever-changing coastline. For hotels accommodation in other areas near to Sidmouth Devon see Exeter hotels & Budleigh Salterton hotels.